I am back on the Williams College campus for the first time in a few years. This place is so familiar to me, and yet there are a handful of major architectural developments that have changed the place substantially since my last visit. I am exploring the replacement for Baxter Hall--the student center and dining hall I knew--the beautiful new Paresky Center. Spring Street has been largely transformed since my undergraduate days and there is a new academic building south of Sawyer Library. The theater has been thoroughly renovated and expanded as well, and that's where I am heading tonight. Happily, most of the campus remains just as I remember it. 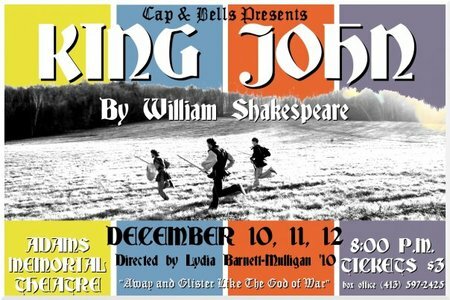 Last weekend, while lining up some 2010 travel arrangements, I stumbled across the fact that the Cap and Bells theatrical troupe at Williams would be staging King John during the last few days of the College's fall term. Tonight was opening night. So once my team's practice wound up at 4:30, I jumped in my car and drove to Williamstown so I could knock off this rarely-performed Shakespeare work in my attempt to complete the canon. I was pleasantly surprised to find that the play is a rather enjoyable work. The Williams production--directed by a senior--was a very creditable endeavor, presented in the vastly scaled down Adams Memorial Theater (the College built a new Mainstage and converted the AMT into a much more intimate space). I thought this might be the hardest play to find on stage, but I suspect the three installments of Henry VI will be the final entries in the Bard's traditional canon that I will see produced. Back in Williamstown, home to my alma mater, for a few hours tonight. Had an enjoyable dinner with the Confortis followed by a visit to the Clark Art Institute's new (to me, anyway) addition, the Stone Hill Center, which provides spectacular views in the gloaming. This page contains an archive of all entries posted to As Far As You Know in the Williamstown, MA category. They are listed from oldest to newest. West Palm Beach, FL is the previous category. Wilmington, DE is the next category.